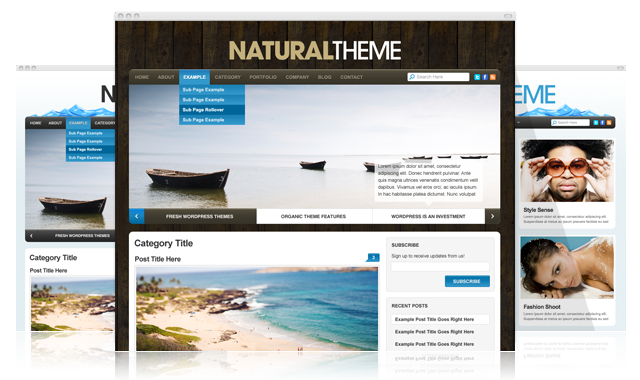 By popular request we have created a theme based off the design of our original Organic Themes site, the Natural Theme! Buy it here, and check out the demo here. The Organic Natural Theme comes with 2 color variations, Earth and Ocean. The Earth variation is designed with brown earth tones, while Ocean has a cool blue color scheme. The Organic Natural Theme comes with a variety of features that make it an ideal candidate for multiple purposes. It can be used as a business site, informational blog, a portfolio and more. Like our other themes, the Organic Natural Theme was developed to be versatile and customizable. The theme can be made uniquely yours with only minor changes to our solid design and development foundation. The Organic Natural Theme features several of our most popular theme features, including a couple new ones. For instance, we have included a sweet jQuery hover effect for the featured content slider that displays the excerpt of the post. It’s sleek, elegant and provides a way to read about the post without being rushed to the next slide. If you have questions about the usability of the theme, feel free to refer to the Theme documentation.